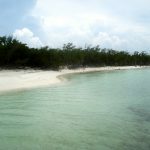 We chose to leave La Habana yet again, this time we went on a catamaran around the peninsular beach of Varadero, which is located about two hours from the capitol in the northernmost part of the island. 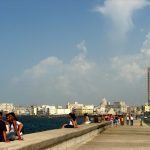 It is the largest resort town in Cuba, where Europeans flock to in hundreds due to the fact that the city is made up of twenty-two kilometers of gorgeous beaches and islets. Kristin and I were delighted to be spending the day in the most comfortable clothing that exists for us, our bikinis. Our tour included: snorkeling, swimming with dolphins, lunch, and then an afternoon at Playa del Blanco. The best part of the day was completing something on my Bucket List, which was to swim with dolphins. Of course, it would have been even more special if it had happened in the wild, and it will happen one day with the amount of time I spend in the water, but for now my desire to get up close and personal with these beauties was satisfied. After multiple kisses from the dolphins it was time to visit a beach I will never forget. . . Funny, how could I forget about our dolphin-kissing excursion? 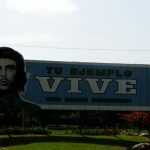 It just seems so far removed from the rest of our Cuba trip! 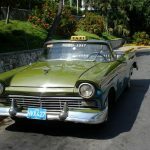 I’m glad we just did Varadero for a day and didn’t stay overnight–it definitely felt like it could be the Florida panhandle or anywhere generic in the Caribbean! BUT there were DOLPHINS! oh my gosh those dolphins kissing you on each check?!?! how cute is that! such amazing animals. How lovely,lovely,lovely it is that you went on this adventure! What a great blog! I went swimming with dolphins once at Discovery Cove in Florida, and it was an incredible experience! I’m so glad you could knock something off your bucket list. And who doesn’t want a kiss on the cheek from a dolphin? Adorable. Looks like fun! You seem to be very popular among those dolphins– what a triple kiss! Snorkeling and swimming with dolphins looks like a great time. You know dolphins are one of the few animals that seek sexual pleasure for fun, right? Those kisses could mean more than you think. I always have a soft spot for Dolphins. When I went to Key West last year, my main goal was to swim with the Dolphins, but I planned wrong and missed the boat . That last picture is so cute! Your smile is as wide as it can be! I have a dolphin encounter of my bucket list too, but somehow I let chances go because I’m looking for the perfect conditions. I have to give that up and just go for it. Looks so fun! Jealous!! I want to swim with dolphins, this looks great! One thing I need to add to my bucket list is swimming with dolphins. Sounds so fun! Wow, I’m going to Cuba NOW. You make me want to get on the 1st flight there! Oh my goodness! An amazing post!!! I found your post super interesting! Thanks for the awesome post – I love reading it! I absolutely love the last pic. it brought such a huge smile on my face. 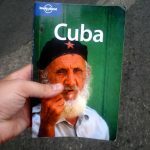 I plan to go to Cuba soon. and I have just gone through your entire series of Cuba. reading every post word for word. Too bad most of the YT music videos didn’t work.